Front-wheel drive (FWD), rear-wheel drive (RWD), and four- or all-wheel drive (4WD or AWD): You’ve probably heard these terms kicked around before. They’re the three main types of engine and transmission layouts for motor vehicles, and they’re often used to classify and group cars. Not all layouts are created equal, and they certainly all do not perform in the same way. Each layout comes with its own inherent handling characteristics that significantly affect the way a vehicle behaves. 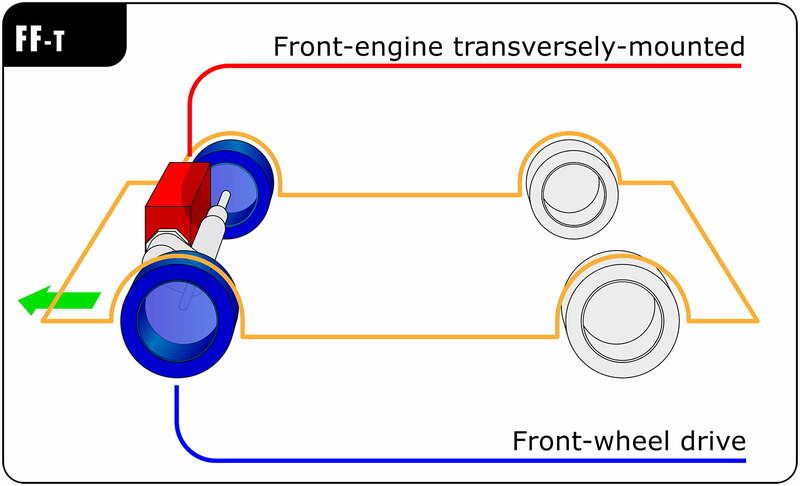 The handling behavior of each layout is also affected by where the engineers place the engine. Engine placement can alter the weight distribution of a vehicle, playing a huge role in handling, especially in inclement weather, or during high-performance driving. So, what do these terms mean, especially in terms of handling and performance? Overall, each layout generally has its own reputation. But before we get into that, let’s go over the basics. What is rear-wheel drive (RWD)? Rear-wheel drive, which is often abbreviated as RWD, is the oldest layout. It denotes a configuration in which the engine sends its power through a transmission to the rear axle of a vehicle. The 1885 Benz Patent-Motorwagen, which is often considered the very first car, was rear-wheel drive. In America, a vast majority of cars were rear-wheel drive through the 1970s. The configuration is becoming increasingly rare in 2019, however. What is front-wheel drive (FWD)? Front-wheel drive, which is often abbreviated FWD, denotes a configuration in which the engine sends its power to the front wheels. Front-wheel drive surfaced during the 1900s on various prototypes, and it became common during the 1930s when French automaker Citroen released the Traction Avant (which means, literally, front-wheel drive). Saab and Audi precursor Auto Union used the layout early on, but the most famous — and most influential — front-wheel drive is undoubtedly the original Mini. Small economy cars began shifting to front-wheel drive during the 1970s, and most new cars sold in 2019 use this configuration. What is all-wheel drive/four-wheel drive (AWD/4WD)? All-wheel drive and four-wheel drive, abbreviated as AWD and 4WD, denote a configuration in which the engine’s power gets sent to the four wheels for maximum traction. Four-wheel drive is normally used to describe a type of heavy-duty system found on trucks and SUVs, while all-wheel drive often refers to a more basic technology that equips sedans, station wagons, and crossovers. Most pickups and SUVs remain four-wheel drive in 2019, and a growing list of cars offer all-wheel drive either standard or at an extra cost. There is usually a mechanical connection between the front and rear axles, but electric cars sometimes offer what’s called through-the-road all-wheel drive. 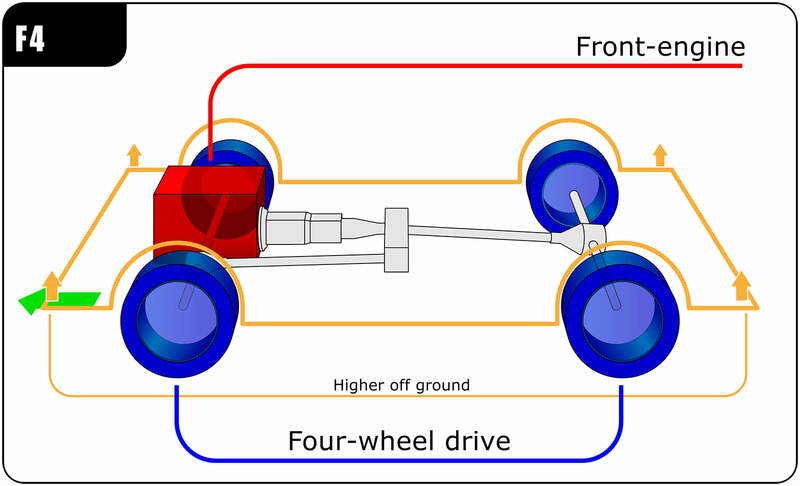 Both axles are driven, but there is no connection between them; engineers achieve this by placing an electric motor over each axle. See our piece on the specific differences between “four-wheel drive” and “all-wheel drive,” for a closer look at both systems. That’s one of the most loaded questions in the automotive world. The truth is, it really depends on the situation and the application of the system. For instance, any type of four-wheel drive system is perceived as superior in low-traction situations. That makes it most favorable for those who live in regions where it snows quite a bit, or where paved roads are a luxury. More recently, all-wheel drive has become more prominent in performance applications as a way to increase traction. When it comes to two-wheel drive layouts, and the argument of front-wheel drive versus rear-wheel drive, the debate becomes even more complicated. Because of its age and history with the origin of the automobile, rear-wheel drive was once the most prominent type of drivetrain because of its simple and cost-effective design. As technology evolved, cheaper development costs made front-wheel drive more popular due to packaging and fuel economy. That’s because front-wheel drive vehicles require less parts since the power- and drivetrain are typically all one unit that sits at the front of the vehicle. There’s no such thing as a rear-engine, front-wheel drive vehicle because it makes zero sense in terms of engineering complexity, though some rear-engined vehicles are four-wheel drive (like the Volkswagen Vanagon Syncro). As for which is better, well, again, it depends on the situation. Both front-wheel drive and rear-wheel drive vehicles have their disadvantages, but both have proven themselves well, especially when the car is equipped with the proper tires for the weather. How well each configuration performs in inclement weather is what concerns most vehicle buyers, because motorists want a car that can get them from point A to point B reliably. Four-wheel drive is usually the better solution, but not every car offers the option, and the ones that do often carry a price premium. Front-wheel drive vehicles tend to perform better in everyday driving situations, particularly during inclement weather. That’s because both the engine and the transmission sit over the front axle, adding weight to the drive wheels, which increases traction for slippery situations. Most manufacturers of standard cars have resorted to front-wheel drive because they’re cheaper to make, more efficient in operation, and provide better traction to the everyday driver. Rear-wheel drive vehicles, despite being the original layout and preferred in the earlier days of motoring, have disadvantages to the everyday driver, and become trickier to handle when bad weather sets in. Not everyone is capable of handling a rear-wheel-drive vehicle in a snowstorm, for example. In many ways, your environment and daily routine will dictate which drivetrain is right for you. If you live in either a fair-weather or mild, four-season climate with modest levels of snow and rain, you can get away with pretty much any drivetrain choice. All three layouts have their advantages and disadvantages when it comes to driving fast. Front-wheel driven vehicles tend to exhibit what’s called understeer, or when the vehicle resists its own ability to steer because the front axle is overloaded. This is what we know as the sensation of “turning the steering wheel and nothing happens,” and Newton’s first law of inertia physics comes into play. That’s because front-wheel drive vehicles put a lot of demand on the front axle, requiring it to both deliver power and manage steering, which can easily overwhelm the front tires. Truth be told, front-wheel drive and rear-wheel drive both have proven themselves as tried and tested in motorsports. Examples of legendary front-wheel-drive racing include the original Mini Cooper during the famous Monte Carlo Rallies and, more recently, the British Touring Car Championship, which almost exclusively features front-wheel driven racing cars. Rear-wheel drive is preferred in performance applications since its layout offers the most flexibility and versatility without any sacrifice in performance. In other words, rear-wheel drive cars can have their engine sit either at the front, in the rear-middle, or in some unique cases, the back (like the Porsche 911 or the original Volkswagen Beetle). For performance drivers, rear-wheel drive also provides the most balanced feel. Handling characteristics of rear-wheel drive vehicles are very predictable with the right talent behind the wheel. That’s usually due to weight distribution, and the fact that you’re not asking a set of wheels to do more than one action. Also, because the rear wheels are the drive wheels, they often exhibit what’s called oversteer, which occurs when the rear of the vehicle rotates around a curve because the rear drive wheels lose traction, causing the weight of the vehicle to shift and break the rear end loose. For performance drivers, this is preferred over understeer since oversteer can be recovered a lot more easily — again, if you know what you’re doing behind the wheel.